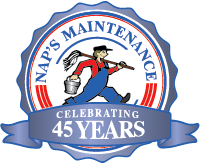 Tim Henry has been with Nap’s Maintenance for over 30 years. Carrying on the tradition of service that made Nap’s famous, Tim has expanded the list of services and upgraded the technology to meet the needs of his customers. “Working with our customers is the best part of my job,” says Tim, “and every day when I’m out there, I love to meet the people we’re helping.” Tim is a hands-on general manager of Nap’s, but you won’t often see him sitting in the office. Not content to let others do all the work, Tim is constantly out in the field, performing the day-to-day tasks alongside other Nap’s Maintenance staff and checking in on customers for that extra attention he feels they deserve. Mark Priest has also been with Nap’s over 30 years, and for good reason. “I care about the people I serve here,” says Mark, “I’ve met a lot of wonderful people doing this work.” To Nap’s customers, his dedication to going above and beyond is the stuff of legend—many customers request him on their projects. They know that with Mark, “It’s all about making the customer happy.” Mark’s experience on the Attleboro police force and his current position as a Lieutenant with the Attleboro Fire Department, have helped him earn the trust of the local community, as well as the expertise for more challenging special jobs and cleanups. It doesn’t sound like Mark has a lot of free time, but when he’s off-duty, he enjoys fishing, golfing, and traveling with his family. John J. Brusseau has been providing top-notch service for over 5 years in our 3rd shift commercial cleaning crew. John has always been passionate about what he does. “I find satisfaction in doing my job well, and pleasing customers the first time,” he says. John always believes in doing the very best job possible, and being open and honest with coworkers and clients alike. Pleasing customers is his number one passion – and his number one goal. When John isn’t working with Naps, he enjoys a variety of hobbies and activities. Living in Rehoboth, MA, he enjoys spending time with his 5 children, and he’s an active member of Community Covenant Church, where he spends his time being involved with both his church and his surrounding community. His other interests include the blues, spending time outdoors and gardening – especially planting flowers – and classic farm tractors.